Healthy sleep has a characteristic architecture, comprising of a number of sleep stages. In regular sleep, these stages occur in a specific order and each contributes to health and wellbeing in a different way. This article will help you understand the importance and characteristics of each stage, as well as how these stages and the overall architecture is affected by sleep deprivation and polyphasic sleep schedules. Important bodily rhythms such as the Circadian rhythm are discussed in relation to optimal sleep times at the end, explaining the importance of sleep time selection for a sleeping schedule. There are four different stages of sleep, which are cycled through during a regular sleep. These stages are Light Sleep 1 and 2, Rapid Eye Movement (REM) Sleep and Slow-wave Sleep (SWS)1. Each of the stages has unique characteristics and contributes differently to a good rest and day to day function of the body and the mind. Light Sleep, sometimes also referred to as LNREM (Light Non-Rapid Eye Movement) sleep, is not as deep as SWS and REM sleep. Light Sleep is further divided into two categories, generally referred to as NREM1 and NREM2, or simply L1 and L2, for brevity. The Light Sleep stages generally occur during transitions between wake, SWS, and REM sleep. NREM1 primarily occurs when falling asleep. It is nearly indistinguishable from wakefulness and people that are woken from NREM1 often claim to not have been sleeping at all. However, EEG recordings confirm that brain activity in NREM1 differs from that found in awake individuals. Up until this point, no vital purpose of NREM1 has been discovered2. and it may be partially responsible for motor memory consolidation5. During sleep restriction, NREM2 is the most affected phase in terms of reduction of time spent in this phase6. There is a chance that it serves some function in the developmental phase of the brain; although if, and to what extent, is not known. Sleep spindles, defined as waxing and waning rhythmic waves at 7-14 Hz that happen periodically every 3-10s7 are an EEG hallmark of NREM sleep8. A distinction between spindles that occur in NREM2 and NREM3 is that the NREM2 spindles are easily identified visually9, while NREM3 spindles can be less distinguishable10. Sleep spindles may play a role in memory consolidation11, specifically narrative memory and working memory12, the development of motor activity13 and sensorimotor functioning12, and are also speculated to be a biomarker for psychiatric disorders such as schizophrenia14–16. K-complexes are a salient waveform of sleep and a characteristic feature of NREM2. They also appear in NREM317. They stick out during NREM2 because of their large amplitudes compared with the relatively low amplitude of the background EEG activity, but they are less obvious in NREM3 because of the presence of similarly high amplitude delta waves17. K-complexes are suspected to aid in information processing18, memory consolidation of sensory and possibly also emotional memory similar to sleep spindles and processing of external stimuli during sleep19. 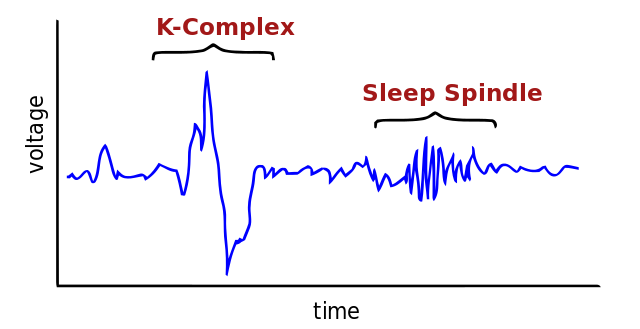 K-Complex and Sleep Spindle – Example of brain activity captured by EEG. Slow-wave Sleep (SWS), often also referred to as NREM3 (historically also NREM4) or Deep Sleep, is an important sleep stage serving a number of functions. NREM3 greatly contributes to formation of declarative memories20, muscle healing and tissue repair, waste product removal from the brain, immune functions and glial cell restoration21. Arguably, one of the most important functions of SWS is the removal of metabolic waste products from the brain, by the Glymphatic system22. During SWS, the brain cells shrink in size to allow removal of the potentially neurotoxic intracranial fluid. SWS is the deepest type of sleep, and is therefore the hardest to wake from. This increases the chance to completely miss an alarm altogether during this stage. Investigations on cerebral blood flow (CBF) and cerebral metabolic rate (CMR) performed during NREM sleep show that NREM2 is characterized by global levels of CBF and CMR only slightly reduced by 3-10% below the level associated with wakefulness, whereas CBF and CMR during SWS is dramatically reduced by 25-44%23. The most active regions of the brain when awake have the highest level of delta waves during SWS. Because of the brain “shutting down”, people woken during this stage often experience grogginess, brain fog, and headaches. This is because it takes time for the cerebral cortex to resume its normal functions. This phenomenon is commonly referred to as sleep inertia. Rapid Eye Movement Sleep is probably the most widely-known sleep stage. This sleep phase greatly contributes to procedural, spatial and emotional memory formation24. Most dreams happen during REM (+-80%)25. During REM, muscle function and thermoregulatory processes (like sweating and panting) are inhibited1, to keep the body still during dreams (this can lead to excessive sweating if sleeping under thick covers, especially on a polyphasic schedule where the percentual amount of REM is much higher). During these dreams the eyes may move back and forth rapidly, which is where REM sleep gets its name. It is often reported that REM-heavy naps feel like a lot more time has passed. The glymphatic system is a network of cavities in the brain that opens up during sleep26, mainly during NREM3 as a result of neurons shrinking in size27,28. As the neurons shrink cerebrospinal fluid (CSF) begins to flow through these cavities, to carry metabolic waste products out of the brain/spine and into the bloodstream, essentially making it’s behavior similar to the lymphatic system29. This results in around twice as fast rate of clearance of amyloid-beta during NREM3 compared to being awake30. The brain needs to be mostly shut down to allow these neurons to shrink. This process normally takes about 30 to 60 minutes of uninterrupted SWS to complete31. It is uncertain how effective this process is on nap-only schedules as naps do not provide enough time to fully complete this process. The amount of waste that is built up until the next SWS session is however going to be smaller in comparison to monophasic sleep, due to SWS appearing in several naps a day. This means that at the moment no conclusions can be made regarding the health implications of waste products in the brain on nap-only schedules. Polyphasic schedules with cores should however be safe to practice in this regard, provided the core is placed correctly to maximize time spent in SWS. Normally, sleep is experienced in cycles during which the body transitions between the above mentioned sleep stages. During a monophasic schedule, each cycle lasts approximately 90 minutes. However, this can vary between 80-120 minutes from person to person32. If allowed to wake naturally, people will on average sleep for 5 of these cycles, for a total of just under 8 hours of sleep. 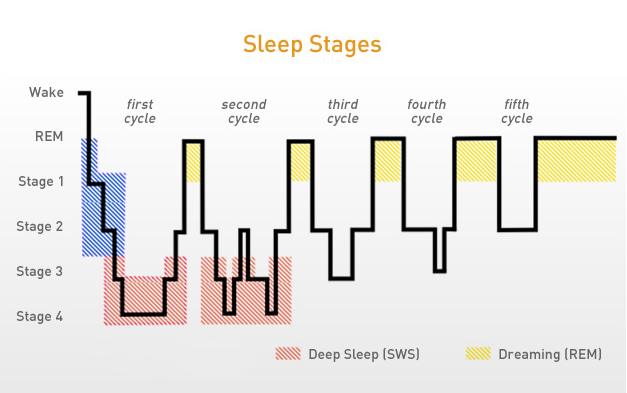 Sleep Stages during Monophasic Sleep – illustration modified from Guidescroll. Every sleep cycle theoretically contains some amount of SWS and REM. However, due to influences of the Circadian rhythm, SWS is often most prevalent in the evening, while REM is more prevalent in the morning33. Assuming the sleeper is not sleep deprived, the cycle structure is quite predictable. The first 25-27 minutes are typically spent in light sleep; then the SWS stage begins. After this the body transitions through NREM2 into the REM phase34. When SWS deprived, SWS onset will be a bit faster than normal, and when severely SWS deprived, it is possible to get SWS mere minutes after sleep onset35. Depending on external circumstances it is possible that REM and SWS requirements could be higher each day, for instance, doing heavy sports would increase SWS need (due to muscle healing and tissue repair). The baseline requirements also vary between persons. See “Lifestyle Considerations” for more information about this. Carskadon MA, Dement WC. Normal human sleep: an overview. Principles and practice of sleep medicine. 2011;4:16-26. http://apsychoserver.psych.arizona.edu/JJBAReprints/PSYC501A/Readings/Carskadon%20Dement%202011.pdf. The importance of sleep & why we need it. Human Givens Institute. https://www.hgi.org.uk/resources/delve-our-extensive-library/dreaming/importance-sleep-why-we-need-it#.U2kpm8fhjys. Published October 23, 2015. Accessed November 4, 2018. HAMILTON J. Lack Of Deep Sleep May Set The Stage For Alzheimer’s. NPR. https://www.npr.org/sections/health-shots/2016/01/04/460620606/lack-of-deep-sleep-may-set-the-stage-for-alzheimers?t=1539868577354. Published January 4, 2016. Accessed November 4, 2018. Natural Patterns of Sleep. Harvard Medical School – Healthy Sleep. http://healthysleep.med.harvard.edu/healthy/science/what/sleep-patterns-rem-nrem. Published December 18, 2007. Accessed November 4, 2018.